I have been wanting to do this for so long. Yes, help this is what some might call, mind in homage to the late DJ Screw, mind a Screw Tape. I’m fully aware that this is an acquired taste for many, but this is my show and I acquired that taste a few summers ago so you are going to listen to this and like it. 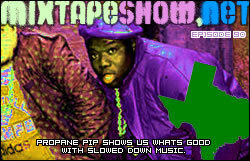 On this show, which was bootlegged off of KSKR 88.9FM this summer, DJ Propane Pip of Man Hol’ Up Radio takes over the wheels of steel and takes us on a ride through Passmore, Texas. Suburb + Donwill – A Funeral March. You asked for it – here’s some more. Notice that I didn’t do a thing to this song – it came like this. As would be expected from the duo, the song is wildly different from everything else, and it’s good. suburb, and donwill. T. Waters – Tears (DJ Slice Remix). Yet another Sliced and Screwed (his words!) remix. This is another one of those songs that just sounds better slowed up. myspace.com/twaterssosodef. Floetry – Say Yes (Propane Pip Slowed and Slopped Remix). What can I say? Propane Pip ain’t no 5000 Watts, and this probably never should have been done, but hey. It’s the Mixtape Show. *ducks* myspace.com/floetry. This entry was posted in episodes and tagged dj dmd, dj propane pip, dj slice, donwill, episodes, fat pat, flippa boys, floetry, lil keke, screw, spank rock, suburb, t waters by dex digital. Bookmark the permalink. yes son yes! let the replies/flames begin but also let it be known that i’ve already (before listening to the whole thing) declared this the best ep ever! Good Selection. Watts is trash. SC – haha! – so what’s the final verdict? biggda – I don’t know if I could call the dude trash – he made Mike Jones sound palatable. And that’s a feat in and of itself. If you have other recommendations for DJs who can do this stuff right, holler…my vocab is definitely kinda limited in this area. Rafiki – yeah, it’s definitely an acquired taste. For whatever reason though, I dig it. Maybe you’ll dig the next one though..
little does everyone know… that’s one song that ya’ll just spent 20 minutes listening to. be grateful you can experience matrix time. it took me some 3 times to acquire this. Cii – 3 times? was the site crashing or something? leen – isn’t that a slogan or something? I’m also noticing that your name is appropriate to this episode. supercali – matrix time is the new normal time. For those who don’t “get” this stuff at first listen: you might be listening in the wrong mindstate. It’s basically still summer here for me, so my recommendation would be to burn this on a CD or plug your iPod into the stereo system on your car and take the scenic route home from work, slowly. That should help some. I’ve found that bicycling, iced tea, and parks also go well with screw music. dex, about 3 times to acquire, cause this was something new to me. oh, okay. Glad it grew on you. and automatic deleting of podcasts if you listen to them? Is this some “feature” that I’m not aware of? Cii – oh, okay. you had me worried for a second, I was about to go to Apple and start knocking heads. For some reason, the moment 25 lighters kicked off, I just completely got it. And I have never tried anything like this before. Another cool thing about this style is that the speed does something awesome for the bass. Steve – yeah, man. For me, the first time I heard this kind of stuff, I was hooked. Be careful, though – when you find yourself chopping and screwing Postal Service live on air on college radio, you know it’s time to (no pun intended) slow down. I speak from experience – I got a lot of angry calls that night. Other things that sound good slowed and sliced: old jazz records, disco, the Whispers’ “And The Beat Goes On”. I think I’m going to try Bjork later on today. Sara – haha! Actually, as I was posting this, I was thinking to myself that this wouldn’t be your flavor. Yeah, I was actually surprised that Suburb went that direction with this song.